That is nice biochar researchers want to investigate PAHs before committing to the massive scale production of biochar required for sequestration of carbon to offset emissions. For individual people though when dealing with brush it is probably much better to turn it into biochar with a clean burn instead of a bonfire that produces more smoke (and PAHs). So in some cases it is a pretty obvious improvement. Coal tar asphalt sealer is about 15% PAHs, something to think about there for sure. Most likely we are all taking part in a full scale uncontrolled experiment on the impact of PAHs already! I ended up using a meat gringer with a geared down motor attached to do the crushing. I really like the design of your setup. Any chance you a video of the build or breakdown of the design? @roth2000 I wish I had time to do a break down video. You are not the first person to ask. Maybe I will some day. There is a book that features the unit I built with a little more detail. It was written by a friend of mine that originally introduced me to biochar. Here is the link to the book on Amazon. 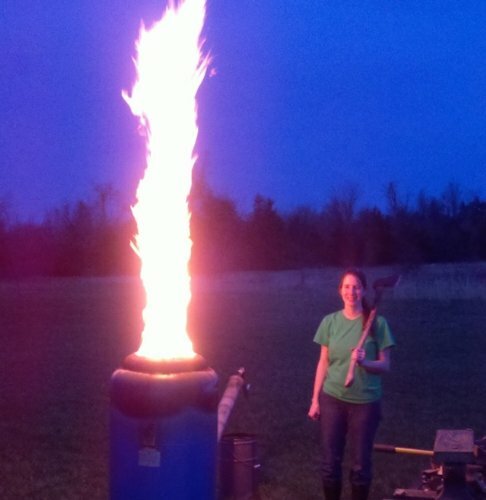 Just for fun, here is a picture of a huge flame I took one night while making biochar with the wife. Just missing the hot dogs and marshmallows in that pic.